Friday night of my school's teaching outing last week was a late one for me, and after a full week of school too. Imagine my frustration when I woke up on Saturday... at 7am. I couldn't fall back asleep, as the other ladies had also woken up and were chatting in the living room where they'd slept. So I changed and sat with them on the floor, trying to look engaged but not knowing what anyone was saying. Over an hour later, we were called in for breakfast out where we'd had dinner the night before. Chicken and rice porridge, ramen noodles, and plenty of kimchi! (Korean breakfast is nothing like an American breakfast). After breakfast we packed up and eventually boarded the bus. 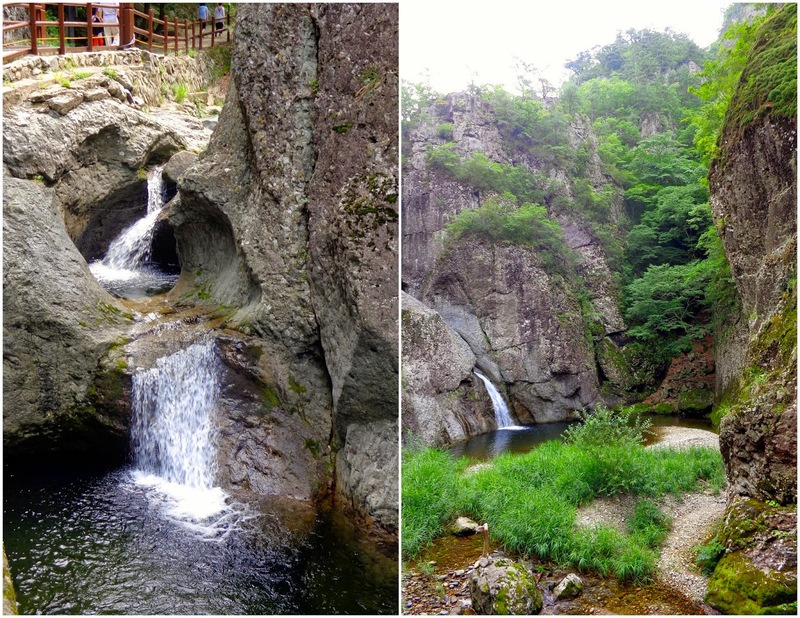 We drove to nearby 주왕산 (Juwang Mountain) for some hiking. 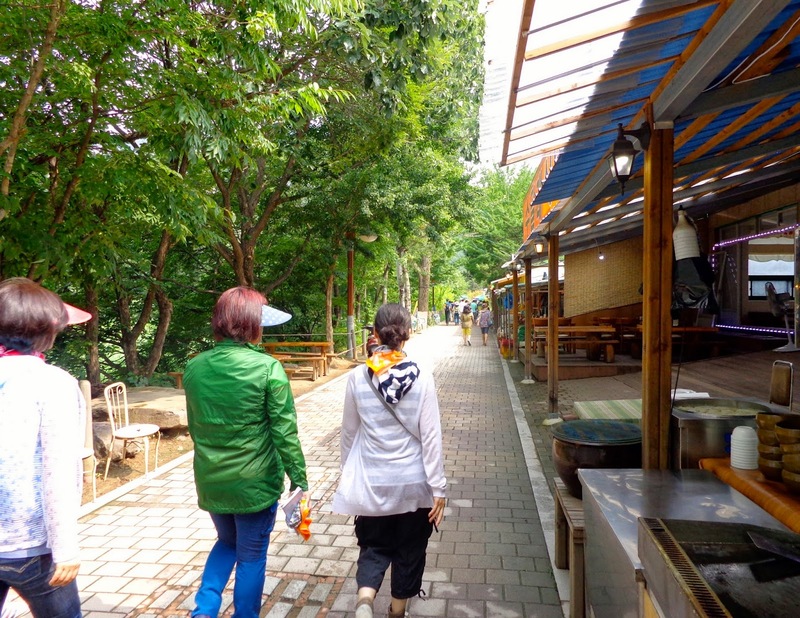 While walking to the base, we had to walk past rows of restaurants and little shops. It felt a bit odd/touristy, and the librarian said she doesn't like it because it pollutes the fresh air. One teacher asked my co-teacher, who then asked me in English, "Do they put restaurants on the base of the mountains like this where you're from?" After a brief pause to think, I had to answer, "Um, we don't really have mountains like this for hiking where I'm from." The two "taller" places I could think of where people hike are Devil's Lake and the bluffs in La Crosse, but those aren't mountains. So I couldn't compare the two. It was really excellent. 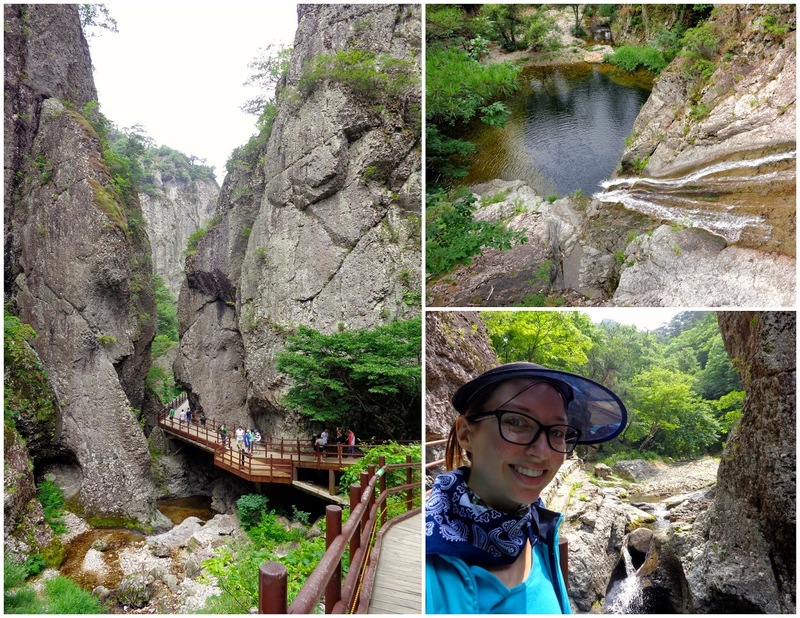 I love that hiking is such a common hobby in Korea (thanks to the plethora of mountains, no doubt), and that it was totally normal to be enjoying the outdoors in physical activity with coworkers. We saw a three-tier waterfall, which was pretty incredible. Being in the mountain made you feel small, and helped put the world/universe back into perspective. At the final waterfall, pictured above, there were two butterflies that weren't afraid to land on people. 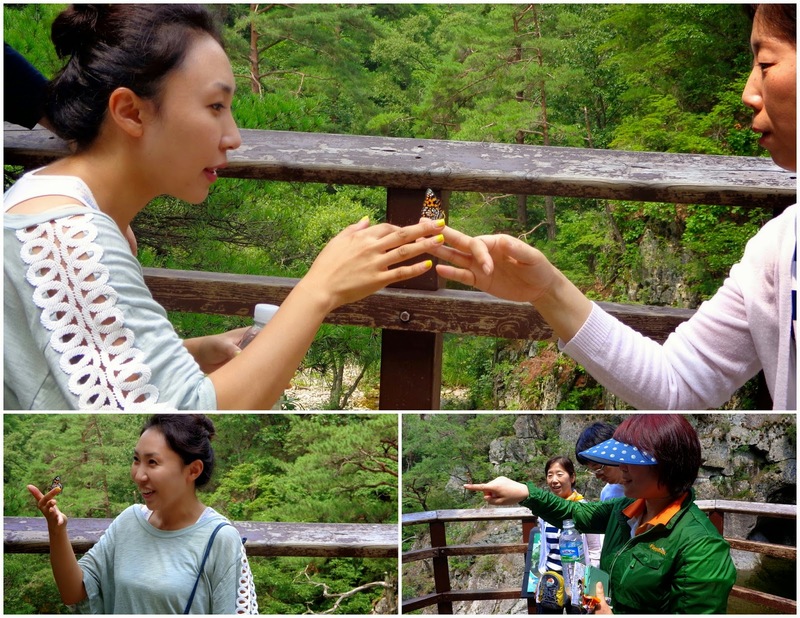 Many of the teachers took turns holding a butterfly on their finger. My co-teacher tried passing one to me a few times, but every time it flew away. There was mention of canoeing afterwards, but by the time everyone got back down and to the bus (2 hours later? ), one co-teacher told me they'd decided to skip the canoeing and we'll go straight to lunch, and then home. Perfect! I was wiped, mostly from lack of sleep than the hiking. We drove to the restaurant and walked behind it to this outdoor roofed eating area. I'm used to taking shoes off when you go to a restaurant, but when we got back there I was a little surprised to hear my co-teacher tell me "Take your shoes and socks off here". Socks? Why do I need to take my socks off? I wondered. I glanced at the teachers who had already taken the two stairs up to the dining area, and saw two people wearing socks, so I left mine on. There was a pool of fresh spring water underneath the table! I have to admit, my very first thought was "Oh no, I don't think I can have fish munching on my feet during an entire lunch," thinking back on my experience in Bangkok. To my relief, there were no fish in the water. It was quite cold, though refreshing after the hike. 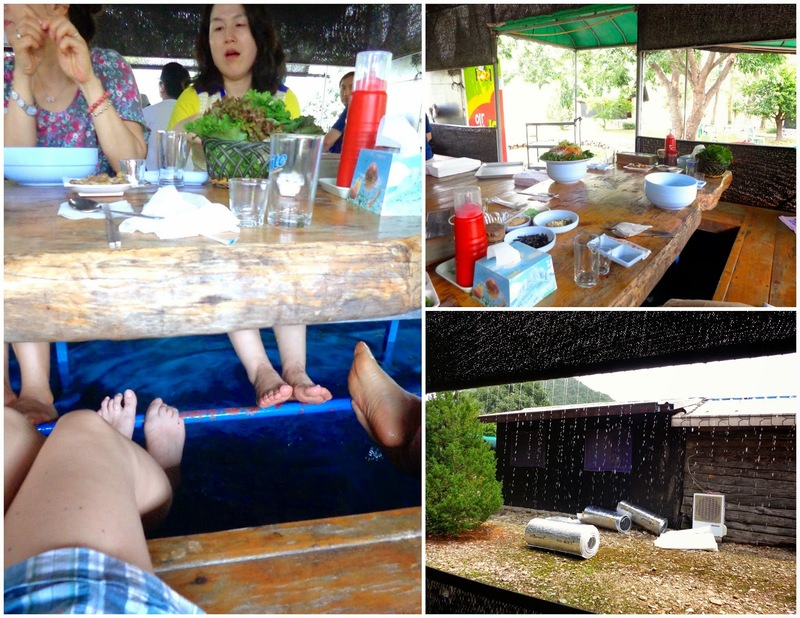 There was a bar underneath the table, upon which we could rest our feet, so they weren't submerged the whole time. 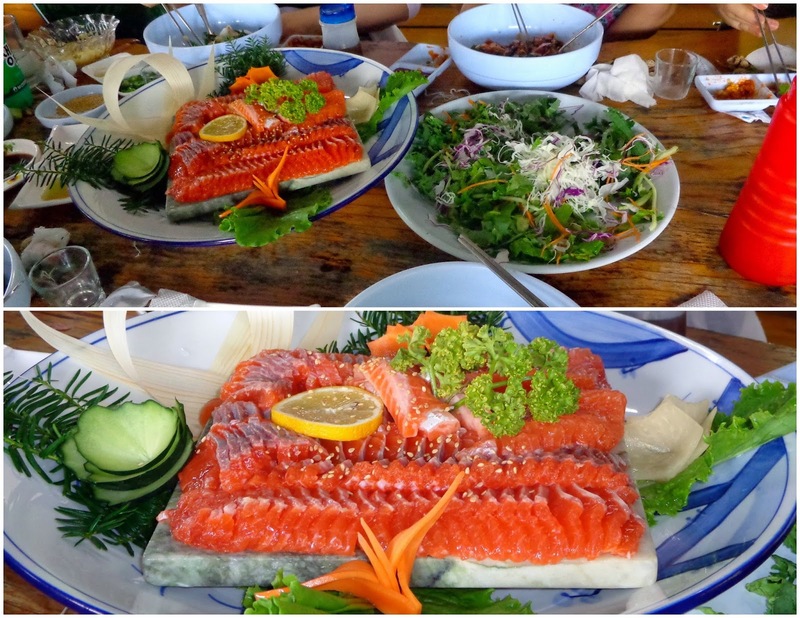 On the menu: raw trout. You take a bunch of veggies into your bowl, add this spicy red sauce, some bean flour, and maybe a bit of dried seaweed, some raw fish, and then mix it all together. I took four or five pieces to start, and left it at that. Pretty sure I munched on some bones, and I wasn't sure how my stomach would take the raw fish. It was fine. And then I loaded up on more veggies - yum! It was a long, relaxed meal. After the fruit had been served, some people started going to use the restroom. It seemed as though the meal was over, but then they brought out rice for everyone, plus hot trout soup. And then, around two thirty perhaps, we loaded up the bus for the ride home. I settled in on the bus ready to pass out with a nap, so it surprised me when we stopped only a few minutes after. Was this a rest stop? I put on my purse and followed everyone off the bus... and they all started walking. Another hike? I was so confused, but just went with it. 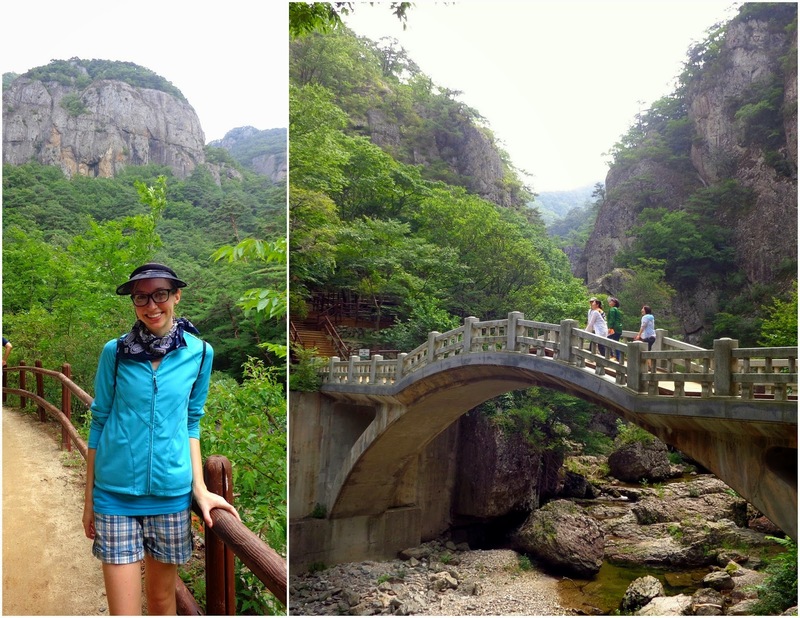 Thankfully it was a very short hike, as I was really tired from the night before. 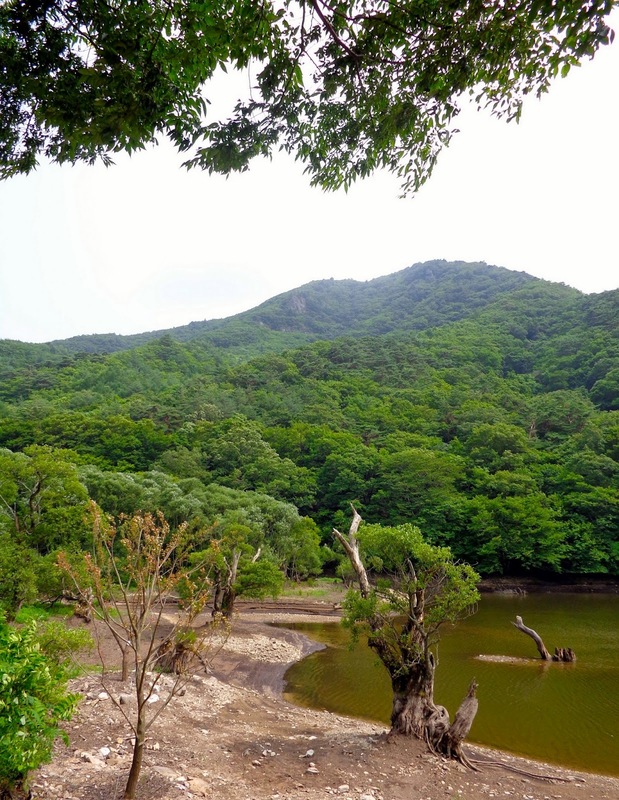 It took around 5-10 minutes to walk to the dead end where we took a picture by the lake, and then we walked back. We didn't make it back to school until just after seven in the evening. It definitely felt like a much longer day and a half than my usual Friday nights and Saturdays at home. 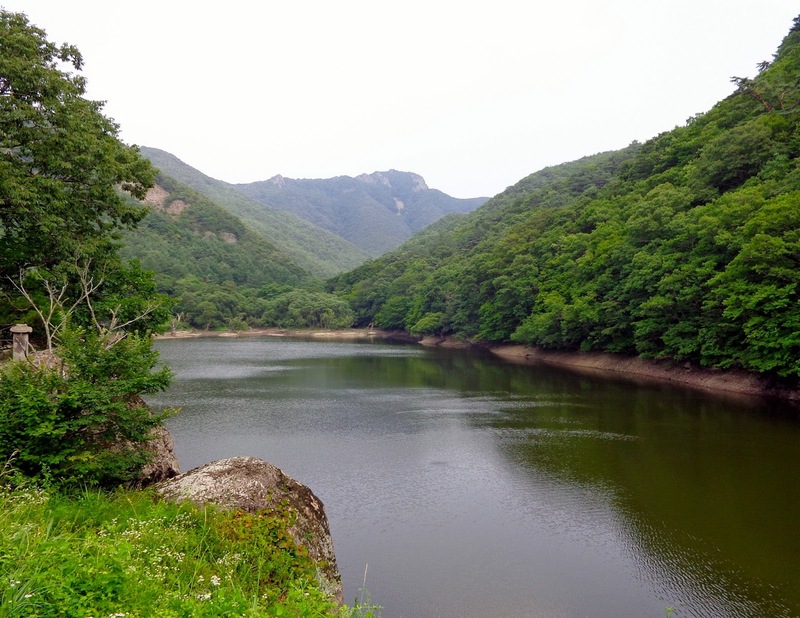 I was happy to be able to see another part of Korea, and enjoy the outdoors and nature. Wow, this is fantastic -- lots of new experiences. I really like the idea hiking and then having your feet soak in fresh spring water as you eat. So cool. And the raw tuna looks delicious (I'm a fan of sushi) -- gosh Korea is so healthy. 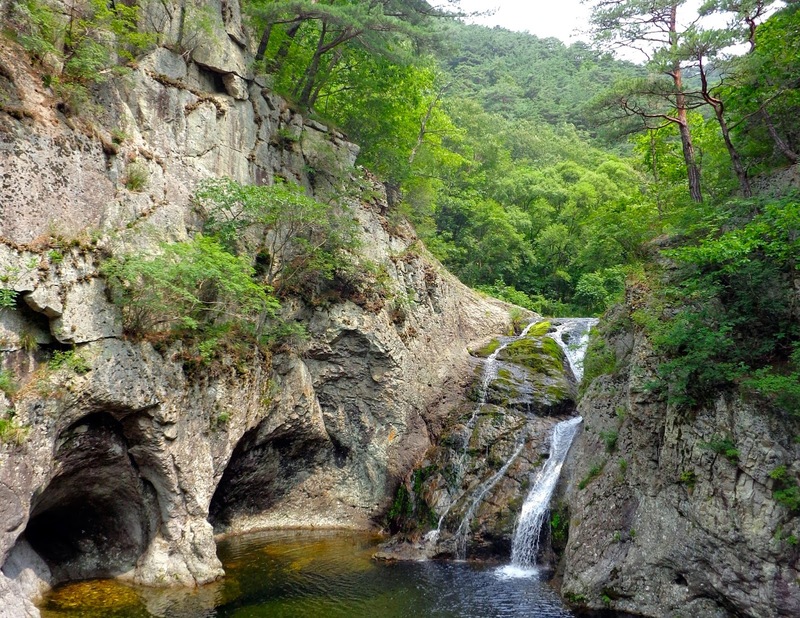 I want to go to 주왕산! Hah thanks - the visor was super helpful with that strong sun! It was an a-ha moment (I finally understand why they wear them! ).